It is one of the most liked desserts when it comes to coffee and drink. It is fresh, delicate, beautiful and exquisite, come on, it has everything! Prepare the mousse by putting the milk to boil. Meanwhile mix the sugar and the yolks and beat lightly. When the milk begins to boil mix the two preparations in the fire while stirring until you notice that the cream begins to catch body. Set aside, strain into a bowl and cool quickly. On the other hand, put the gelatine tails in cold water, remove from the water, drain them and introduce them in the microwave for 5 seconds. Add the melted gelatine to the English cream (previous preparation) while stirring with the help of hand rods. The moment we notice that the cream is almost cold add the Mascarpone cheese well cold and mix very well with the rods of hand or with the electric and then the cream semi mounted carefully from the bottom up. Allow to cool for at least 12 hours before serving. 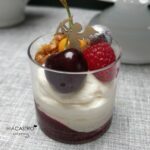 When serving, introduce the mascarpone mousse into a pastry sleeve. To make the streusel sift the flour and the almond powder, mix with the sugar and add the butter. If you want you can do it in the kitchen robot. Wrap the dough in film and freeze. Once frozen, grate on a silpat or baking paper and bake at 170 º C15min. Prepare the raspberry coulis putting the red fruits and the sugar on the fire. Allow to simmer for 15 minutes. Remove, mash, add a few drops of lemon juice and strain. Allow to cool before use. 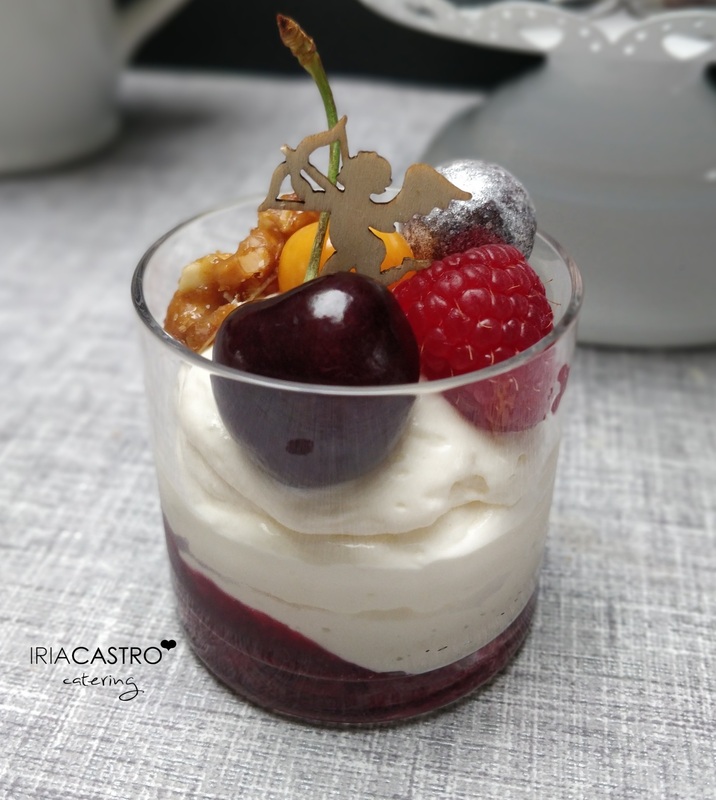 At the time of serving arrange the Streusell in the bottom of the cup, then a little raspberry, the mascarpone mousse and finish with more culis and many natural red fruits.